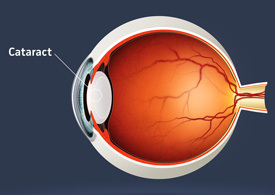 A cataract occurs when the normally clear lens in your eye becomes cloudy, often impairing vision. Clouded vision may make it more difficult for you to read, drive a car or see as clearly as you once did. For most people cataracts, which develop slowly over time, are a natural result of aging. About half of Americans between the ages of 65 and 75 have cataracts to some degree. The key to living with cataracts is knowing when it’s time not to live with them anymore. Usually this happens when your normal lifestyle, reading the morning paper, driving to the grocery store or seeing the expression on the face of a child or grandchild, is jeopardized by impaired vision. Fortunately, advanced surgical methods make cataract surgery one of the most successful surgical procedures performed today. Surgery is the most effective treatment for cataracts. More than 95 percent of the people who have cataract removal end up with better vision. Using microsurgery and local anesthesia, an eye surgeon (ophthalmologist) removes the cataract, leaving much of your eye’s natural lens capsule in place. The capsule helps support the clear artificial lens that the surgeon inserts to replace the cloudy lens. The procedure is usually done on an outpatient basis and takes less than 1 hour. If both eyes are affected, surgery is usually performed on one eye at a time, allowing the first eye to heal before surgery is done on the second one. Phacoemulsification (FAY-co-ee-mul-sih-fih-CAY-shun): This method, often called “phaco,” is the most common cataract surgery in the United States. An eye surgeon uses a special instrument to break up the cataract with ultrasound waves and then vacuums out the emulsified pieces. Phacoemulsification requires only a small eye incision about 1/8 inch (3 millimeters). Once the cataract is out, an eye surgeon inserts an artificial lens implant that has been corrected to meet your eye’s specific needs. The surgeon folds the flexible implant lens to insert it, and once in place the lens opens to about 1/4 inch (6 millimeters). In most cases of cataract surgery, no sutures are necessary. Initially, your eye may have mild inflammation and irritation and may feel a little scratchy for a couple of days. You may need to wear an eye patch for the first 24 hours. Return visits to the doctor are usually set up for the day after and then several times during the next 4 to 6 weeks. Improvement in vision usually begins within 1 to 2 days from the date of surgery. Because your eye takes time to heal from the surgery, the greatest improvement in vision won’t occur until about 4 weeks after surgery. Most people still need to wear glasses after cataract removal. Occasionally, cataract surgery will not be helpful because of the presence of other diseases of the eye, such as glaucoma or macular degeneration. Are you satisfied with your eye health and vision? We are currently accepting new patients and would love to help you with your eye care needs. Call Conshohocken Eye & Laser Center Phone Number 610-397-1747 to make an appointment.